I was born, raised and educated in France. Even as a child I was always interested in mystical and religious places and stories. I was christened, received first communion and was confirmed at St Jeanne d' Arc church in Paris. At age 14 I read the Old Testament in its entirety. My other interests were dance, the theater, music, the arts and philosophy. I was already a voracious reader, favoring political texts, avant-garde French literature as well as English, American and Russian literatures. I came to live in the United States in 1967 and became even more interested in the arts. I also begun my study of Native American beliefs and practices. In 1976 - 78, I apprenticed with a Medicine Man. I also read many Native American texts and took courses in physical and cultural anthropology. 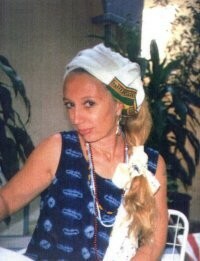 During those years and until 1982, I also studied Herbal Medicine, Massage Therapy and Midwifery. I started my study and practice of Voodoo in New Orleans through my friendship with a world-renowned Obeah man from the Bahamas in the late 70's. This was followed by a personal and dramatic encounter with the Loa in December of 1982. In January of 1984, I started a year and a half journey that would take me to sea, sailing 9 months throughout the Caribbean Islands, visiting 13 islands, Obeah Men, Root Doctors, Shamen, Rastafarien Elders and Voodoo Priests. It was during a stay on the North Coast of Haiti, at Cap Haitien that I received my first Loa. This journey led me to the Fort Lauderdale river, living aboard a sailboat anchored in the mangroves and visited daily by the lovely and gentle manatees.I had a second and very dramatic encounter with the Loa. Then the journey continued sailing into the Atlantic with the Gulf Stream and up the Chesapeake Bay.Again I lived anchored in the middle of the river in Annapolis for several months. The two-week journey in the Atlantic was amazing: on the 41-ft ketch so we kept a 4 hour on- 4 hour off schedule. The hours on watch meant a long and deep meditaiton, entirely tunedin to the slightest atmospheric or other change in the sea or sky.It meant navigation by the stars, more pleasing to the eyes and the soul than the compass. It meant friendship with the school of dolphins who escorted us an hour or so each morning, finding the exact spot we would be on any given day. It meant absolute estrangement from all other living beings - not even a bird flies out this far from land . It meant absolute awe and fear when thunder and lighting struck near and great ripples of fire spread on the water surface like the Tree of Life upside down. It meant absolute centering with the dome of unfathomable distances of the sky above and unfathomable depth of sea below, while the horizon stayed circular and one was the center at all times!! To this day, this is one of the favorite places of the heart I can choose to return to day after day! After my return to New Orleans around 1986, I started working with Joshua Frank, then Voodoo King of New Orleans and a year later with his daughter, Voodoo & Yoruba Priestess Rose Yaffa Frank. After apprenticing several years with Priestess Rose, I received formal initiation into the Tradition of New Orleans Voodoo. I worked at the New Orleans Historic Voodoo Museum in New Orleans, first as its public relations representative, and later as its Director. I also was privileged to work on several books with a friend: a novel based on the travels of Jesus through India, a book on the Enneagram theory, and a book on physical, mental and spiritual healing. After the untimely deaths of both Priest Joshua and Priestess Rose Frank, I deliberately left any commercial practice of Voodoo, concentrating instead on developing and strengthening an authentic daily spiritual practice that would become the foundation of my future works. Between 1980 and 1984 I made numerous trips to California to study with my Sufi Master who was a living saint as well as a renowned scholar and authority on the Koran. These summers of continuous blessings at his side led me to be accepted for Sufi initiation from Pir Vilayat Khan , Head of the Sufi Order of the West. This initiation took place in Paris, in the private chapel built by his own father, the founder of Sufism in the west and world-acclaimed healer and mystic Inayat Kahn. Between 1986 and 1989 I was the caretaker of the Sikh Ashram in New Orleans, having already obtained permission from my yoga teacher (an early disciple of Yogi Bhajan) to teach Kundalini Yoga which I continued to do until quite recently.Living at the ashram spurred me to read and study more of the eastern sacred texts and philosophies. I had read the Koran and now read the Bhagavad-Gita. I also studied the lives of saints and mystics: Guru Nanak, Sirdi Sai Baba and many more. From 1978 until 1987 I also studied modern and African dance with several renowned teachers, in the US, in London and Paris and choreographed many of my own works. I have performed my pieces in London, San Francisco, New York and New Orleans. On Our Lady of Guadalupeûs Day in 1987 I gave birth to my second daughter and fourth child. That same year my two oldest children had blessed me with my first two grand-children: my first daughter had a son and my eldest son had a daughter. At this present time I am blessed with six grand-children and 2 great-grand-children. During the 1990's I continued my religious studies both in the Vedic Tradition and in Buddhism. I received many blessings in both traditions and was granted the empowerment of the Blue Buddha of Medicine from Tibetan Lamas. During those years, I also studied Reiki healing and was accepted as a Reiki Master. In 2000 my daughter and I took the vow of Boddhicitta from His Holiness The Dalai Lama thanks to the great generosity of our Voodoo friends, Louis Martinie and Mishlen Linden. Today I feel very much like I have come full circle. And I also know that there is yet so much much more to learn and study. My house in the country is truly the Abode of all Angels, Saints and Spirits and an abode of faith. Since my formal initiation into Voodoo,I have had several more rather dramatic encounters with the Loa as well as continuous and reciprocal communications. I continue my service to them, seeking their guidance and protection, as well as being absolutely faithful to my other vows and Deities. I inherited my great intuition and psychic ability through my family's gypsy background and have used the Tarot in divination and spiritual counseling since my youth. I remember well my own mother reading an ordinary deck of cards, as well as folk remedies used in cases of illness. The powerful scent of healing herbs often filled the house. When I look back today, I see very much the hand of Destiny and my stops at the Crossroads! My mother read playing cards and I was fascinating with the practice. I begun studying the Tarot at 17 and have been reading cards ever since, using the Ryder-Waite, the Tarot de Marseilles, the Ukiyoe, the Medicne Woman Tarot, the Herbal Tarot, The N.O Voodoo Tarot, and the Feng Shui Tarot. Some of these decks have been with me for over 30 years! I also read the I-Ching and Cowrie Shells. I am always learning from the omens of birds in flight and other natural things. I am mostly clairaudient, although sometimes clairvoyant as well. I am still very much involved in Dream Work and Trance Work. The last 45 years have been the Great Journey of Life, full of children, dance, poetry, paintings, rituals, studies and deep sorrows. Most of it has been spurred, directed and nourished by a profound love of life and God. My faith is unending and unflinching! I continue to develop and deepen my spiritual practices and am blessed to meet many others, devotes, guides and teachers along the path. I am an avid reader and student of history, recognized for my work as a licensed tour guide in Louisiana, and leading groups from all over the world as well as scouting for many television and motion picture events. I have developed with the help of Dr Bob Thomas, Chair of Environmental Studies at Loyola University, presentations on the Louisiana Wetlands, its fragile ecology, fauna and flora.I regularly foray into the swamps and make regular offerings at the Big Branch Marsh National Wildlife Refuge near my house. My formal studies in dance consist of years and years of studies and workshops with many many great dancers, dance groups and choreographers:The Martha Graham Co, Twyla Tharp Co, The London Contemporary Dance Theater, Shikisha Dance Troupe of South Africa, and many gifted individuals such as the great late Roger Robichaud of Off-Point Theater in New Orleans. Roger was a great Zen Master and his teachings went far beyond physical movements. As a choreographer and performer I have created many events that united viewerûs excitement with authentic tradition, gathering some of the best Voodoo drummers of New Orleans. My amazing Voodoo Rituals have included fire-eating, machete duels and snake dances, all accompanied by authentic drumbeats and traditional songs to the Loa in Creole and Lucumi. During the last 20 years, my Louisiana cottage in LaCombe, LA, has become the Madre de Agua Spiritual Temple, and here are kept working altars to the Loa and Orisha. I have also created groves and sacred offering places all around in the Moon and Star garden, planting many trees and herbs and flowers which are sacred to the Lwa, Orisha and Deities. Throughout the house I keep altars to many Saints and Deities, Buddha and Tara. We often receive clients for one-on-one consultations, blessings, cleansing, initiations or spiritual healing ceremonies which are conducted both in the Temple and at the outdoor sacred groves. I keep and altar to the late great Queen Marie Laveau and all my products are made with her spiritual guidance and offered for her blessings before being sent out to our clients. She also inspires directly or indirectly every new product and takes the place of honor at all services, rituals and ceremonies that are conducted here. These days, I share my time between New Orleans where I consult with clients and lead tours, and my spiritual practices, craft and art works and retreats in my country home, on the north shore of Lake Pontchartrain surrounded by marshes and swamps. There I live at peace with all of nature around me and commune with the Elemental Spirits and Orisha. I aspire to continue maintaining the Madre de Agua Spiritual Temple with integrity and love. I also wish to continue my service to others, with the highest quality of products and services, with guidance and blessings from the Spirits, my past teachers and spiritual guides. I now grow and harvest 100% of all the bush, herbs and flowers which are used in my Herbal Baths, New Moon and Full Moon Spiritual Baths and Queen Marie's Flower Essence Baths. Everything is harvested, dried and hand-blended by myself at the Altars. Saint Roch was chosen as our patron/benefactor, being sought in New Orleans Voodoo for his healing intercessions. He is also the patron of dogs and those who love them. Each end of year, I spend quite a bit of time in meditation and preparation for the Old Year - New Year Ceremonies and welcoming the Spirits who will guide us in the coming year. Each Saint John's Eve which closely corresponds to the summer solstice, we renew our allegiance to the tradition of New Orleans Voodoo and drum the rhythms that have been heard on Congo Square for over 300 years, celebrating the spirit of Queen Marie Laveau. Every new moon and full moon we gather for a ritual of offering and throughout the year, we celebrate the feast days of the Orisha and Saints. Thus the circle of life continues, standing on the Ancestor's shoulders we celebrate and make sacred.